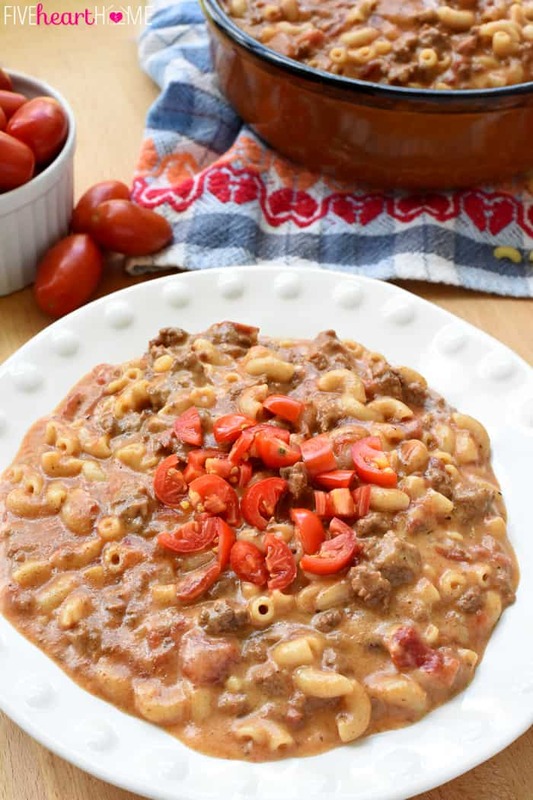 This Homemade Hamburger Helper recipe is a creamy, flavorful copycat of Cheeseburger Macaroni that’s all-natural and made from scratch! Not even gonna lie…Hamburger Helper was one of my favorite dinners growing up. 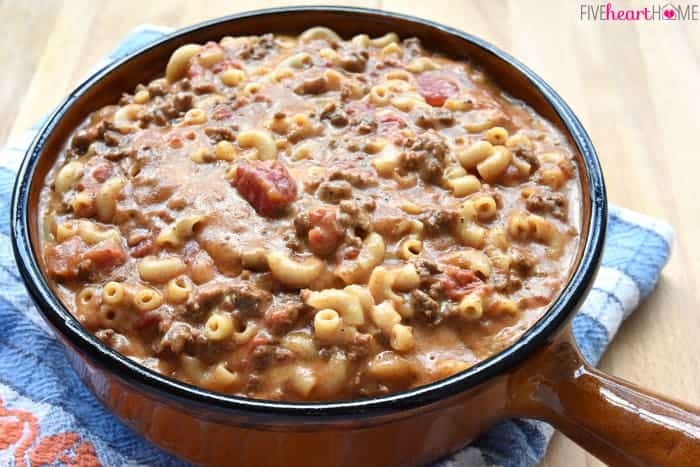 And if you had asked me my favorite flavor of Hamburger Helper back then, I would have had a hard time deciding between Lasagna and Cheeseburger Macaroni. I mean, what’s not to love about beef and sauce and noodles? Simple, tasty, and a winner every time. 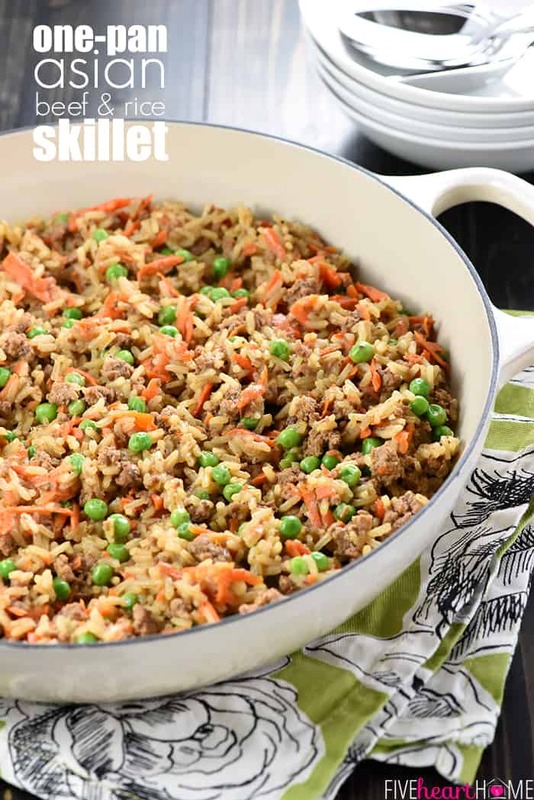 Unfortunately, when I had children of my own and felt the inexplicable pull to embark upon this whole ‘real food kick,’ boxed/processed dinners (like my beloved Hamburger Helper) went by the wayside. And I totally missed ’em! But one glorious day I realized that I could make a homemade, all-natural version of HH (that seriously tastes even better) with not much more effort than what came out of the smiley-faced, hand-bedecked box (which now seems a bit creepy, but maybe that’s just me). So would you like to join in on the deliciousness? Read on! 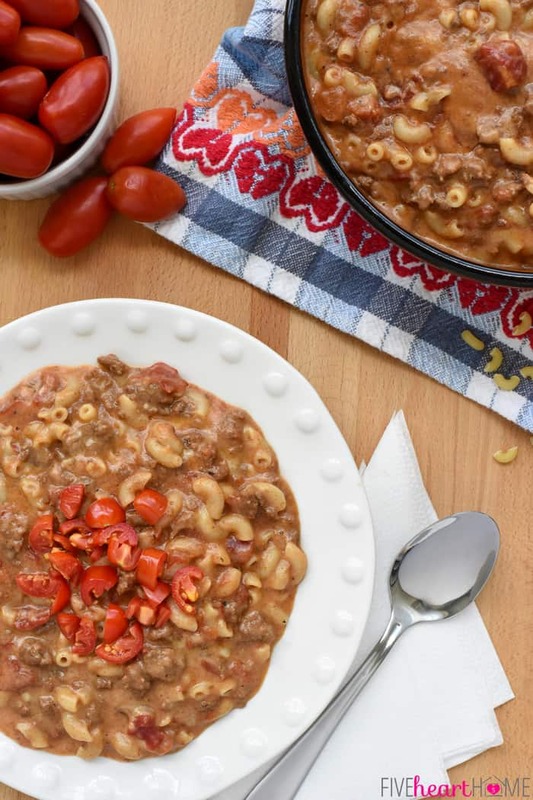 This homemade Cheeseburger Macaroni starts just like the good ol’ Hamburger Helper upon which it’s modeled. Brown the ground beef, add a few seasonings, pour in some liquid, and stir in the pasta. But there are a few crucial additions to boost flavor even more. First off, I like to add a can of diced tomatoes to the mix and then, instead of water, my macaroni has the pleasure of simmering away in beef broth. But the biggest change would be the homemade cheese sauce in lieu of powdered cheese questionableness. Now granted, making your own cheese sauce does dirty up an additional pot. But it is so worth it. You can whip up the cheese sauce while the noodles are boiling and then, once all of the broth has been absorbed, you simply fold the cheesy goodness into the beef and noodle mixture. 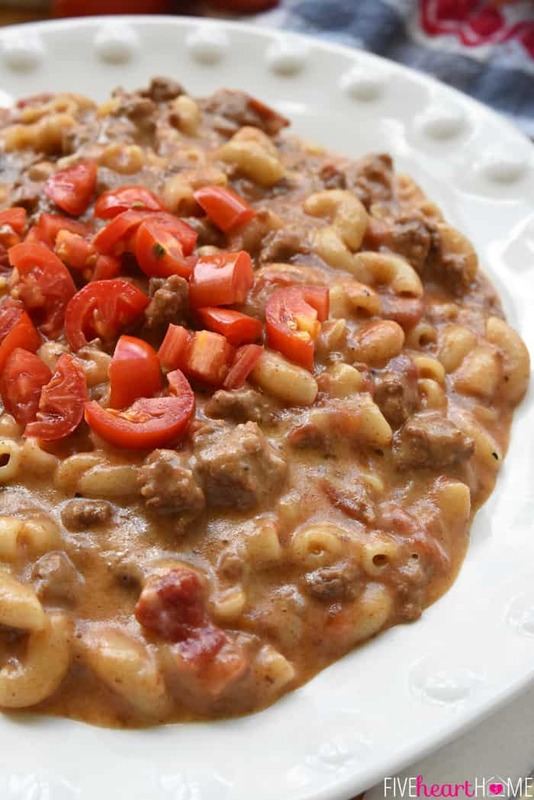 The result is a Cheeseburger Macaroni that’s beyond creamy and cheesy…quite frankly, it puts boxed HH to shame. And BONUS…no icky ingredients! I’m not the only one who loves this stuff. Everyone in the family enjoyed it when I made it the other night (with the exception of the 2-year-old, who currently refuses to eat any dinner not constituted of pizza or sausage, so don’t mind her)… and my eats-like-a-bird middle child actually gobbled down two platefuls. I’m with you, little buddy…this recipe is worth a second helping. Please…promise you’ll make this soon and don’t be intimidated about the homemade cheese sauce. 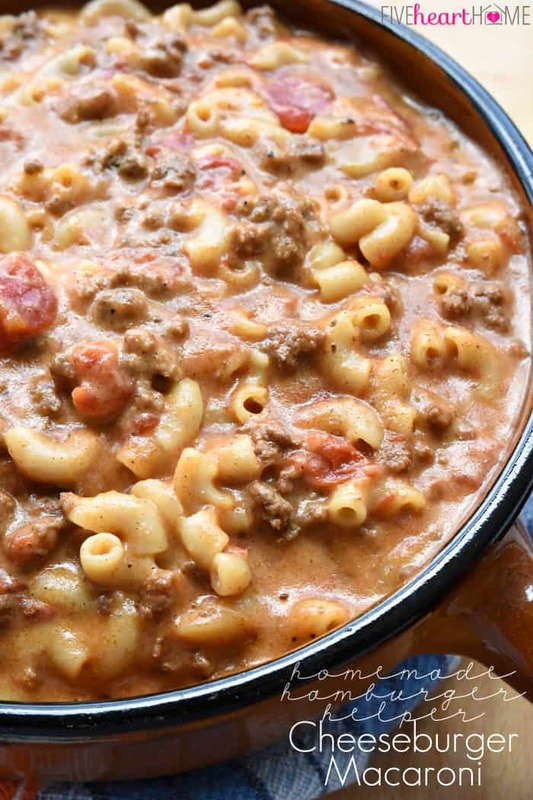 It’s really easy to make and it’s the secret to putting this Cheeseburger Macaroni over the top! 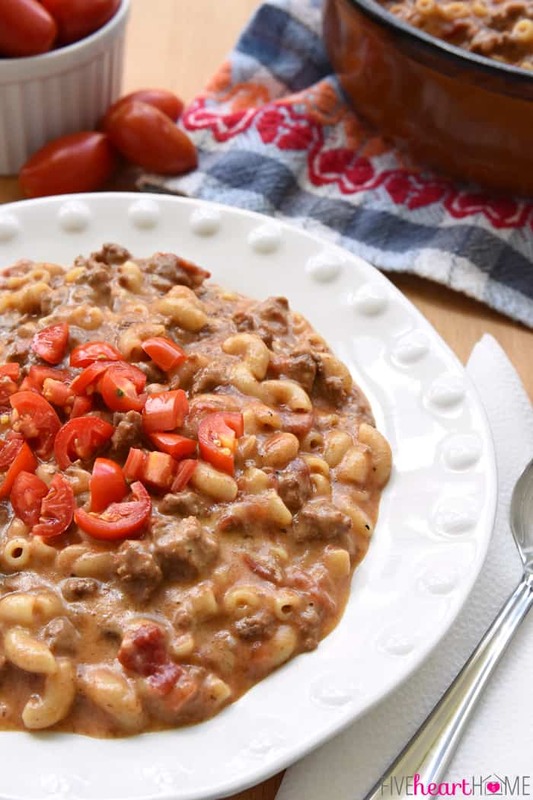 This creamy, flavorful Cheeseburger Macaroni is an all-natural, from-scratch copycat of the Hamburger Helper classic! In a large skillet set over medium heat, brown ground beef and garlic; drain grease. Stir in paprika, chili powder, garlic powder, onion powder, sugar, salt, and pepper. Mix in diced tomatoes, beef broth, and macaroni; heat to boiling. Reduce heat to a simmer and cover pan. Simmer for 12 to 14 minutes, stirring occasionally, or until pasta is tender. While the beef/macaroni mixture is cooking, prepare the cheese sauce by placing a medium pot over medium heat. Melt butter. 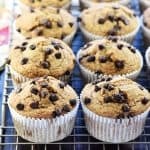 Use a whisk to stir in flour, whisking continuously until light golden brown, about 2 minutes. Continue to whisk while slowly and gradually adding milk. Whisk until sauce is smooth and thickened, between 5 to 10 minutes. Remove pot from heat. 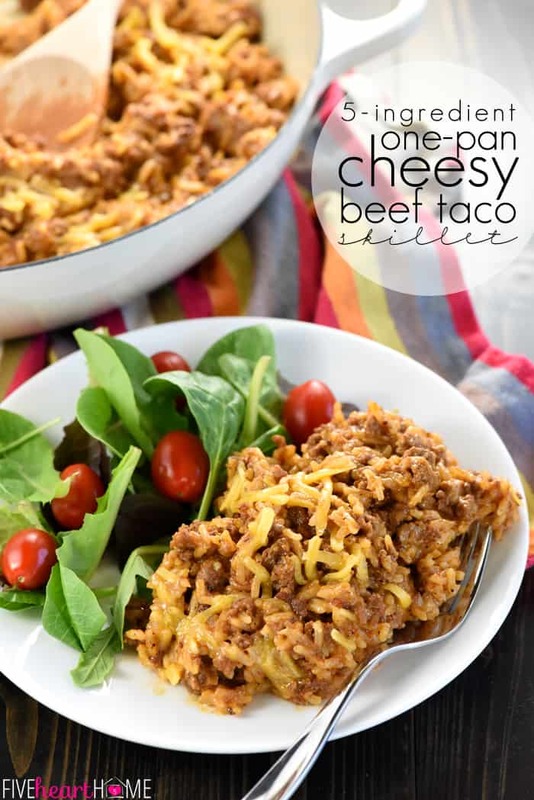 Add grated cheese, 1/2 cup at a time, stirring until completely melted and smooth before adding more. Once all cheese has been incorporated and the cheese sauce is smooth, stir in garlic salt and freshly ground black pepper, to taste. Once the macaroni is done, pour the cheese sauce over the ground beef mixture and stir to combine. Serve immediately. Post originally published on September 8, 2015. Cheesy hashbrown! I thought they were discontinuing it and bought five boxes once. They didn’t. Just wanted to let you know that I made this last night and it was a hit. I did want to ask you if you drained the meat after cooking and if you drained your tomatoes. Congratulations on the book! I’m so glad y’all enjoyed this, Rebecca! But oh my gosh…thank you for pointing out that I forgot to mention that the ground beef should be drained! Sometimes my meat is so lean that there’s no grease to drain, but I definitely meant to include that step and I’ll go back and correct it now. As for the tomatoes, those should be undrained. I’ll clarify that as well so that there’s no confusion. 🙂 Thanks again for the comment and hope you have a great evening! 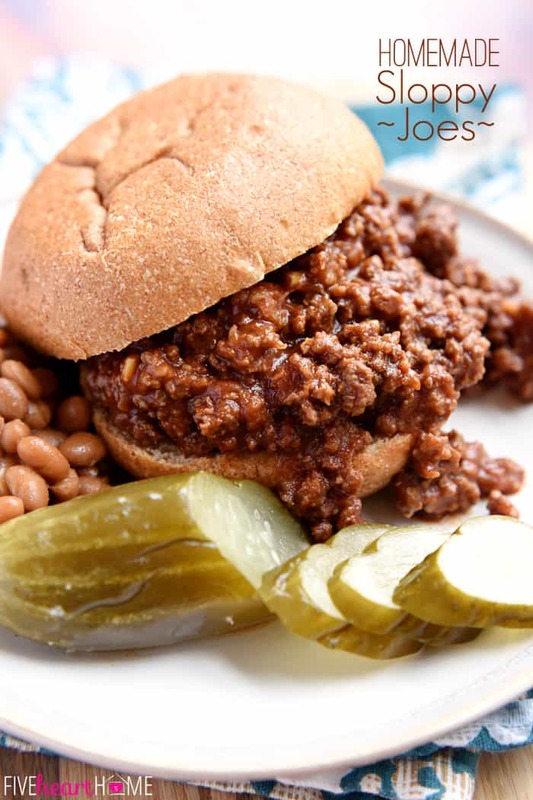 This is a must-try for sure…pinning! Thank you, Sam and hope everything is going well. Happy Fall! I hope your boys love it, Jennifer! My kids aren’t teens yet but it doesn’t last 10 minutes around here either… 😉 Hope you’re having a great week! 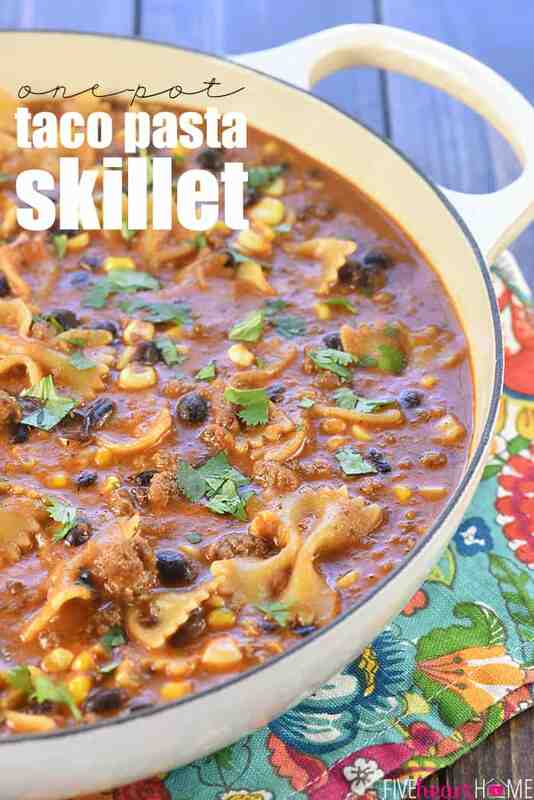 I stopped eating Hamburger Helper years ago because I try to stay away from processed foods. 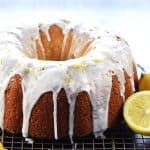 Oddly enough it never occurred to me to try and make it from scratch until I stumbled across this recipe. I fixed it tonight for the first time and I must say, it DOES taste better than the box stuff. Flavor is spot on, just so delicious. 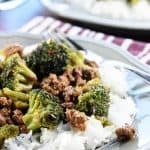 This is a wonderful recipe, definitely going into my favs! Just made this Cheeseburger Mac for dinner and it is AMAZING! Thank you for sharing it. You can bet I ran right over to Pinterest and started following you. I cheated a little using Velveeta though. It worked perfect. So happy to hear it! 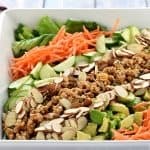 This is definitely a favorite at our house, and it’s what I make when I don’t want to hear any complaints about dinner — ha. 😉 Glad to have you following along on Pinterest! This was amazing! Out of this world, amazing. Thank you! Yay, Haley! It makes me very happy to hear that y’all enjoyed this recipe so much. 🙂 Thanks for taking the time to let me know!